Tycho is a 110 million years old lunar crater about 51 miles (82 km) in diameter. Earlier this summer, NASA's Lunar Reconnaissance Orbiter spacecraft "angled its orbit 65° to the west", allowing its camera to capture this dramatic sunrise view of Tycho (Click image for high-res version). The summit of the central peak is 1.24 miles (2 km) above the crater floor. The distance from Tycho's floor to its rim is about 2.92 miles (4.7 km). 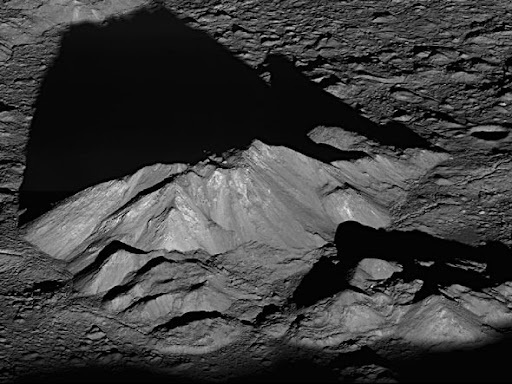 Tycho crater's central peak complex, shown above, is about 9.3 miles (15 km) wide, left to right (southeast to northwest in this view).